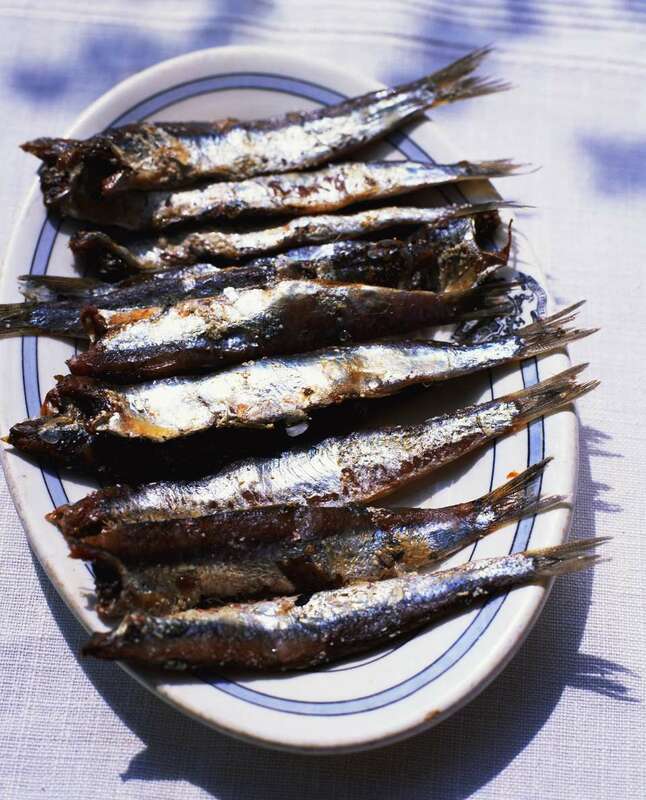 Smoked sardines are mostly seen living in cans, and honestly, smoked sardines are fabulous that way — the teeny bones break down so much you can eat them once the fish rests in oil a while. Here's how to make your own homemade version, which, once marinated in olive oil a few weeks, is far better than any canned product. Start by gutting and washing your sardines. If you want to take the time, split your sardines and remove the backbone and ribs. (Instructions linked below) This is useful but makes the fish far tougher to deal with in the smoker. I leave the bones in. Make the brine by putting all the ingredients above (except the sardines) into a pot, bring it to a boil and turn off the heat. Stir to combine and cover, then let come to room temperature. When the brine is cool, submerge your sardines in it in a large, covered, non-reactive container. I use a large, flat Tupperware. If you find yourself short of brine, make a second batch. In a pinch, you can simply add more water and salt in the same ratio as the original: Four cups to 1/4 cup. Let the sardines soak in the fridge for 12 hours or overnight. Do not let them soak longer, or they will become very salty. Take your sardines out of the brine, rinse under cold water quickly, then pat dry. Let them dry on a rack in a breezy, cool place or run a fan on them for at least 30 minutes. I do an hour. Be sure to turn your fish over once. This forms a layer called the pellicle on the outside of the fish that helps the smoke adhere to the meat. Once the sardines look dry and shiny, put them in the smoker as far away from the heat as you can. I smoke sardines very slowly for 4-5 hours over almond wood. You could use any hardwood, such as maple or hickory or apple. Do not use pine. The goal is to gently cook the sardines to an internal temperature of about 140 degrees. You must do this slowly so the smoke can penetrate the fish and so that the oils in the sardines -- a huge source of healthy omega-3 fatty acids -- do not weep out of the meat. When you are ready, take the sardines out and put them back on the rack to cool to room temperature. Seal in plastic and they will keep for 2-3 weeks in the fridge or a year if you vacuum-seal them and put them in the freezer. Another thing to do with smoked sardines is to cut the heads off and arrange them in a jar or Tupperware and then cover them in oil. Kept in the fridge, these will last months if they're completely covered in oil.